API’s products are manufactured to the highest standards. Well aware of the challenges presented by the region’s price-conscious market, Advanced Plastic Industries is on a mission to convince customers not to compromise on quality. 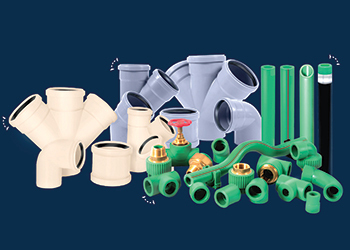 Advanced Plastic Industries (API), a prime manufacturer of high quality plastic pipes and fittings solutions for the construction industry, is making concerted efforts in the region to drive home the significance of selecting quality over price. Established in 1994, API’s factory is nestled in the mountains of Lebanon on 10,000 sq m of land, and operates round the clock. For several years now, API has focused on PP-RCT (polypropylene random copolymer) for water supply applications. As a result, its credibility and quality standards have translated into widespread industry recognition. “Today, API is acknowledged as one of the major players in the pipe business, and has achieved multiple milestones along the way,” Tatiana Abou Chedid, the company’s marketing manager, tells Gulf Construction. It claims to be amongst the first companies to adopt PP-RCT globally, and the first to acquire the SKZ quality mark and DVGW approval for these products. “In accordance with the EN and ISO standards, API’s PP-RCT products are the only ones approved for high-heat installations to date,” she adds. “We are optimistic about the number of upcoming projects that are slowly, but surely, shifting to higher standards of quality. Therefore, we will relentlessly fight to resist the status quo of adopting average products, and ensure that our message of quality is communicated and heard,” Abou Chedid confirms. “Our relationships prevail with clients and firms who value innovation and quality, and are open to adopting new technologies, rather than adhering to traditional ways of construction,” she continues. API employs only genuine, virgin PP-RCT raw material that is pre-compounded in Europe. Its teams of skilled staff continuously research and develop innovative production processes and quality control methods, to ensure world-class products in its contemporary in-house laboratory and tool and die workshop. The company is implementing a multipronged strategy to further penetrate the region through product differentiation and project selection, extensive product availability, and providing full-solution piping systems. Sobha Hartland Estates ... a key supply order for API in the UAE this year. To ensure availability of its products around the world, API manages a broad distribution network, and continuously seeks to expand its leadership amongst additional partners who share its values of constant innovation, superior quality, and client satisfaction. Seeing potential in the demand for its superior performing pipe systems, API International Marketing was established in the UAE. The Dubai-based company provides marketing and technical support to API Lebanon, to better cater to and service the GCC region as a whole. The GCC accounts for 20 per cent of API’s sales, and it has distributors present in Saudi Arabia, Qatar and the UAE. “Innovation has been at the heart of API’s business strategy since its inception. We remain up to date with, and expand in parallel to the global construction industry, to fill any gaps in piping requirements,” she insists. API has recently launched the ApiSilence brand for use in drainage and wastewater applications. Manufactured from the finest mineral-reinforced polypropylene, the range provides outstanding acoustic properties, and fully complies with the most stringent noise-damping requirements (such as DIN 4109 and VDI 4100). The system offers ductility, high resistance to impact, abrasion, and chemicals, and is eco-friendly. The range also benefits from a push-fit connection mechanism, using certified rubber seals (according to EN 68), which can reduce installation time and cost. ApiSilence is specifically designed, via an innovative multilayer piping technology, to provide competitive sound insulation. Also, it aims to preserve an optimum wall thickness and higher flow, in comparison to other products. The inner and outer layers carry a halogen-free flame-retardant additive, to provide additional protection in exposed drainage applications, or in case of fire. “Such features, amongst others, differentiate ApiSilence from other readily available products in the same category. ApiSilence extends its benefits to developers, who will offer better value to clients, to contractors, who will enjoy the ease of installation, and to end-users, who in turn, will benefit from the quieter ergonomic environment,” she explains. API’s most popular product in the Gulf region is its ApiTherm Class 2 range of PP-RCT pipes and fittings. “Class 2 PP-RCT is ideal for hot and cold water applications, as it possesses higher permissible pressure ratings than the standard PP-R, especially when considering high temperatures, in addition to having thinner walls, which allow greater water flow. The quality characteristics are the result of the superior raw material employed and the high calibre of workmanship and dedication that is exercised during the manufacturing process,” she states. These products have secured major orders in the region. 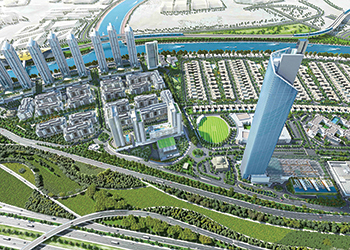 This year, in the UAE, API has acquired orders for the Najmat Towers in Abu Dhabi, as well as the Sobha Hartland Estates and Al Fattan Downtown Towers in Dubai. All three projects are under construction. In Saudi Arabia, which is its largest market in the region, API’s PP-RCT pipes and fittings are being supplied to projects such as the Riyadh Marriott Hotel, the Executive Apartments in the Diplomatic Quarter of Riyadh, and the Saudi Arabian National Guard hospitals in Riyadh, Jeddah, Taif and Al Qassim – all of which are in progress. Back at home, and in response to market demand, API is in the process of doubling its capacity for the ApiThene and ApiDrain brands (expected to be complete in Q1 of 2018). It is also developing its existing PP-RCT range to reach higher diameters (up to 630 mm), to cover wider fields of application. API complies with the most recent and relevant international standards, such as the European Standard EN ISO 15874 and German Standard DIN 8077/8078. Its claim to quality is supported by various certifications that allow for local and global recognition and approval, such as the German SKZ, DVGW and KTW certificates. API’s topnotch piping system is developed and manufactured within an ISO 9001:2008 quality assurance system, however, it is in the process of transiting to ISO 9001:2015. It also plans to obtain the ISO EMS 14001 and the British Standard Ohsas 18001 in a year’s time. API prioritises environmental protection and sustainability. It’s the first in the Middle East and the fifth worldwide to install a photovoltaic (PV) hybrid system at its premises. This set-up cuts costs and reduces the fuel consumption of the generator. Plans are in place to increase the solar energy capacity next year. “These upcoming certifications will further highlight and support API’s quality attestation and credibility, enhance the company’s image, and guarantee that we are better equipped to take on new opportunities in competitive markets,” adds Abou Chedid. API produces a wide range of PP-RCT (polypropylene random copolymer) pipes and fittings, high-density polyethylene (HDPE) pipes, PP-B (block polypropylene co-polymer) pipes and fittings for drainage, and polypropylene (PP) mineral-reinforced pipes and fittings for silent drainage applications.